In fashion we are edging back to the early nineties. The spawn of Bruce Willis and Demi Moore was recently photographed in a flannel shirt. Seattle groups are beginning to look like tailored lumberjacks with their button down, tight fit flannels and lengthy beards. And music is beginning to look to the early days of grunge as we embark on the 20th anniversary of Sub Pop Can you tell yet that this is a repost from 2008?. Spraydog definitely fits the grunge mold, mashing with it garage pop and a droning lo-fi power pop. Add to these elements a blend of boy/girl vocals and the definition is complete. Their music drives forward with raw garage elements; the listener is treated to influences as far and wide as Dinosaur Jr. (think the flat vocals of J Mascis) and Braid (more in the soft and loud guitar work of songs like “Turn The Lights Out”). Where the above two influences hit the grunge rock elements, the songs feature several pop elements. First and most obvious is the upbeat-ish boy/girl vocals. The guitar may be epically loud and equally distorted, but the vocals are clear and pop-driven. “Allison Blaire”, for example, takes the guitar into a more Sonic Youth-like drone. Among top songs on the album is “Bring All Your Sorrows”, where Maria (or Cath, as both are on vocals) and Steve (no surnames are given in the liner notes) continuously chant You’re right / I’m wrong. “Lack Of Sleep” opens softly with rare distortion-less guitar that continues through the song. The male/female vocals divide from Spraydog’s usual complimentary harmonies to include differing lyrics in the chorus. “One Big So-So” removes the male vocals for a fast-paced dual female vocals with hefty guitars that can draw comparison to the heavier side of early Sleater-Kinney. In a way, these sounds are no surprise; the group formed in Northeast England in 1996, upon the growing popularity of mid-90s grunge and garage rock. 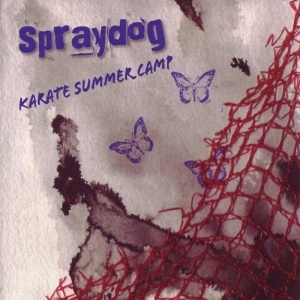 Spraydog, however, does not necessarily sound like a British band—Karate Summer Camp could just as easily have been released in Seattle or even D.C. circa the year of their formation. Jigsaw Records recently announced they would be reissuing the currently out of print Karate Summer Camp. This review was originally published January 7, 2007 on the old version of FensePost. Out Now: Stephen Steinbrink's "Arranged Waves"